A few things inspired me to make blueberry ice cream this summer. First, lately my daughter just LOVES blueberries. Second, my husband's parents were in town visiting from Hawaii, and while they were here they would often go to Trader Joe's and buy giant boxes of blueberries for my kids to eat. And finally, it's summer, and I've been on an ice-cream making kick! I found a recipe for raspberry ice cream in my copy of David Lebovitz's "The Perfect Scoop", so I used that recipe and substituted blueberries instead. The color of the ice cream came out beautiful. And although I enjoyed the flecks of fresh blueberries in it, next time I think I'll try cooking the blueberries down first, to see if I can make a more concentrated blueberry flavor. I just happened to get frozen wild blueberries from my friend who moved out of the country -- hope I can try this after my vacation! I just love that color and my kids loves blueberries. What a refreshing treat for the summer. Beautiful photos...and such a delicious and vibrant ice cream...yum! This is such a beautiful looking ice cream! The color is amazing. This looks so delicious and refreshing! First time on your blog, I am happily following you now. i love david lebovitz' recipes.. he's so good. this looks great, i love the color of the berries. 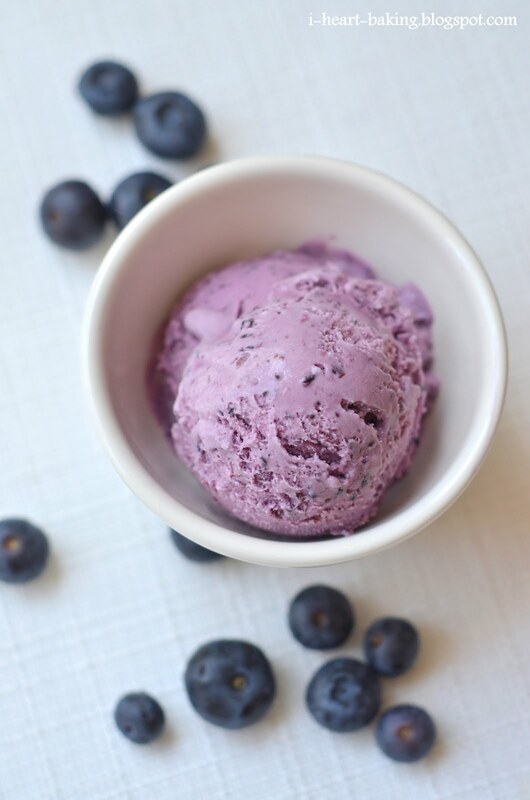 @Xiaolu @ 6 Bittersweets - ooooh, wild blueberries sound like they'd be delicious in ice cream! @Carolyn - you should definitely make this then! let me know how it turns out! @The Slow Roasted Italian - yay thanks for following!!! Beautiful colour! I do know what you mean about the flavour though. I've just tried making a checkerboard cake with blueberries but the flavour wasn't intense enough. Good to try though Happy baking! @christielpy - thank you! yes i used an ice cream maker, mine is an older cuisinart model but it still works great!